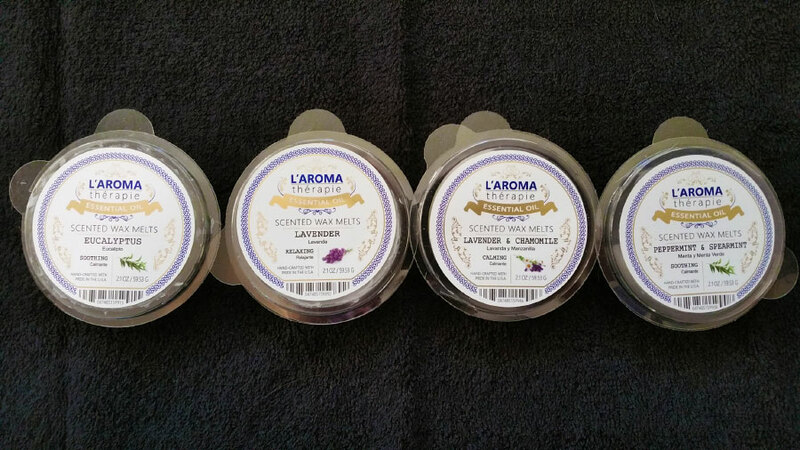 The new Hanna's Candle L'Aroma Therapie Essential Oil Collection of candles and wax melts can be found on the Hanna's Candle (Candlemart) website at https://candlemart.com/collections/laroma-therapie-essential-oil-collection. They use real essential oils instead of artificial scents. The melts are $4.99, rather than the $2.49 for their regular wax melts. And the clamshells are round; in fact, they're the same round clamshells that Goose Creek Candle uses. I really like these scents. They're authentic and calming, and they make you feel like you're relaxing at an expensive spa! This is a pure eucalyptus scent that smells a lot like Vicks VapoRub, but not quite as intense. I definitely smell the menthol. It's perfect to melt when you have a cold or allergies due to the sinus clearing effect (although you only get that effect from close up). I love this scent! This is a true, authentic lavender scent. It even has a strong nasal clearing effect from up close, so it may have a bit of eucalyptus in it. It's not a sweet lavender, but it's also not a harsh or medicinal lavender. It smells like fresh lavender right from the plant. Very nice and relaxing! Chamomile supposedly has an apple-like scent, and I think I smell a smidgen of that. But I detect more of an orange note, although not an overly citrusy orange or grapefruit type note. And it also has the lavender note which is very slightly sweeter than the regular Lavender scent, with a brighter, cleaner note. It also has a tiny bit of that sinus clearing effect like the regular Lavender has. This is pure spearmint with the sweetness of peppermint, and it's fantastic. It's not a sweet candy type mint scent like candy cane though. This is one of those scents that doesn't have a very strong throw, but I can smell it subtly around the house. When I walk into the room, it doesn't hit me in the face the way strong throwing scents would, which is actually a good thing because it's a strong scent, and aromatherapy scents are supposed to be more gentle. Comparing it to the new ScentSationals Inner Zen, that scent is more of an authentic garden spearmint with just a hint of sweetness. This scent is definitely sweeter, with the peppermint note, although it has more of a "toothpaste" mint vibe than Inner Zen, because of the sweetness of the spearmint. I love both scents. Want to discuss this review and other store bought wax? Just join our Facebook group at https://www.facebook.com/groups/scentedwaxretail. Also, I offer a FREE review service for U.S. wax melt companies (retail, indie/vendor, and direct sales), where I review and promote your wax melts on this website (8,500+ new visitors per month), YouTube, Facebook, Twitter, Pinterest, and more. It's a great way to promote your brand and get more customers! If interested, just leave a comment below with your email address and website where I can view your products. 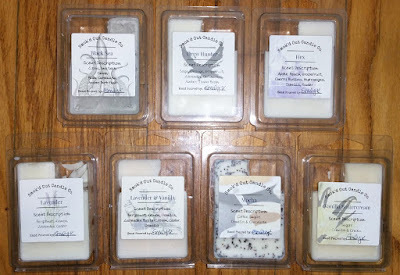 Goose Creek Candle wax melts are found on the Goose Creek Candle website at https://goosecreekcandle.com, but some can also be found at stores like Gabe's and Tuesday Morning. This is a fantastic fruity floral that smells like sweet rich strawberries mixed with a sweet but authentic floral (hyacinth I think, as it has a bit of an Easter vibe). It smells a lot like a H.E.B. exclusive scent called ScentSationals Mountain Laurel (which is the same as an old Better Homes and Gardens scent called Honeysuckle Berry Bliss), and also similar to Better Homes and Gardens Sun washed Poppies (which is the same scent as an older Better Homes and Gardens scent called Sun-Kissed Tulips). But this scent is richer, sweeter, and slightly more strawberryish than those other scents (and I like this one the best). Looking at the notes, I'm surprised I don't see strawberries, but I guess it's the raspberry and "red berries" that I think are strawberries? This smells kind of like maple with a smidgen of orange or lemon, and maybe a little bit of vanilla and caramel, and something else in the background I can't figure out. Looking at the notes, they're spot on, although I don't smell strawberry. OK, the note I couldn't figure out is coconut, although I really don't smell coconut per se. It's quite nice, although it does have a smidgen of a "burnt" quality when melted. This scent does not smell like jelly beans to me, and that's perfectly okay, because jelly beans have a fake grapey fruity note. This scent smells like a super rich, zesty blackberry lemonade with a sweet, creamy, almost marshmallowy note. Looking at the notes, they're spot on, and I do smell a tiny bit of the blueberry. There was a ScentSationals scent called Blackberry Lemonade a few years ago, and although they're very similar, this scent is way better as the notes are stronger (especially the lemon) and richer. It's mouthwatering and absolutely fantastic! This smells like pink sugar, but it's not as sweet and perfumey, and it has a more fruity note that might include apple and/or peach in addition to the usual raspberry that pink sugar scents have, as well as a floral note. Looking at the notes, I'm way off; there are no fruity notes in this one! But I definitely do smell fruit that makes this smell kind of like a rich, sweet peach or apple blossom scent. Melted, I definitely smell more of the fruity note, kind of like strawberry, and it smells a bit similar to the Breezy Tulips scent. I love this one! This is a fresh watery scent with a bland cucumber or aloe note, which I normally wouldn't like, but there's something else in there that keeps it interesting, coconut I think, and maybe a hint of a sweet tropical fruit. It has a tiny bit of bitterness, but not enough to detract from the scent. Looking at the notes, they're spot on. I think I even smell a tiny bit of the mandarin (orange). It's a very fresh, thirst quenching scent, and I like it more than I thought I would! I can't figure out what I'm smelling, but it's nice. It's kind of like a light men's cologne scent with a hint of jasmine and a smidgen of lemon and maybe another fruit like peach. There may be a barely detectable smidgen of patchouli or cedar way in the background. Looking at the notes, no patchouli or cedar, but it's probably the vanilla woods I'm detecting. I don't smell mocha at all. 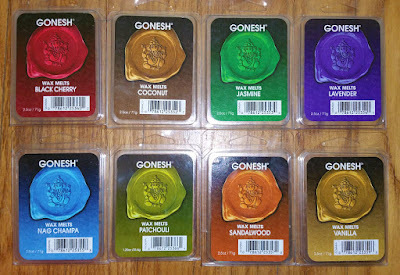 The Gonesh company opened in the mix 1960's, offering incense cones and sticks. 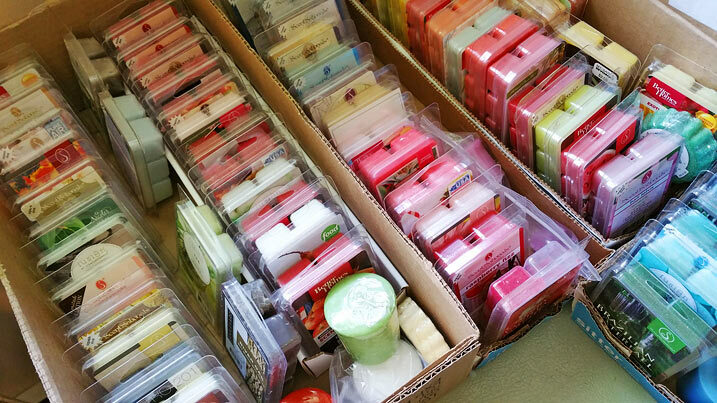 They also now sell candles, potpourri, scented oils, air fresheners, sachets, accessories, and more recently, wax melts, which can be found on the Gonesh website at https://www.gonesh.com/c-106-wax-melts.aspx. Currently only a few scents are available in wax melt form. A nice lavender scent, not sweet, but not medicinal either, and it doesn't have that slightly eucalyptus note that authentic lavender scents tend to have. This is definitely Nag Champa, that sweet incensey scent with a very slight baby powder note. Fantastic scent, and always a favorite of mine! Compared to ScentSationals Nag Champa Incense, they're almost the same. 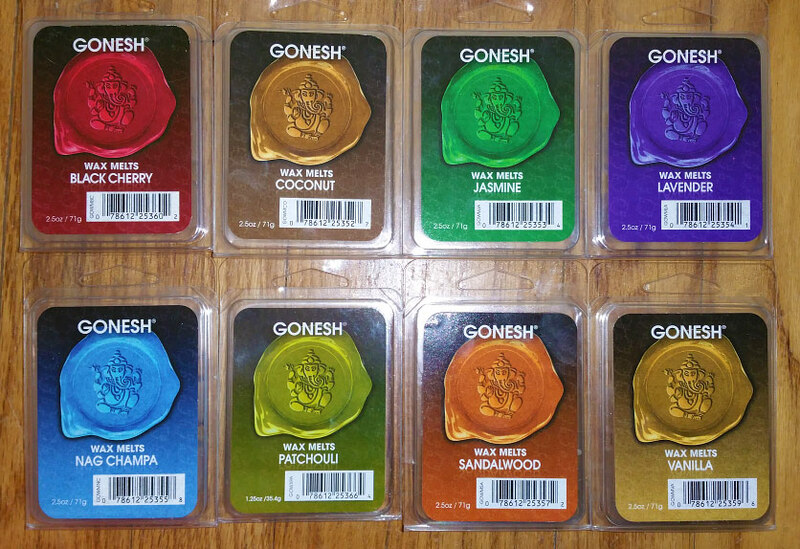 The Gonesh version has more of a baby powder note and I think it's a little more of an authentic Nag Champa, while the ScentSationals version has a sharper, sweeter note with a smidgen of orange blossom, and it reminds me a little bit of men's "Canoe" cologne aftershave. The notes for the ScentSationals version are, "Warm woody patchouli swirled with hints of golden amber, rich musk and oriental spices balanced by undertones of orange blossom and jasmine". I love both versions. Although I do smell the patchouli, this is more of a fresh, soapy, perfumey scent with an incensey note. It's very similar to, if not the same scent as, the Pier One Patchouli scent. I love it! It smells slightly similar to the Nag Champa scent. Sandalwood is actually a light, milky wood scent. But this is a nice men's cologne scent with a hint of woodsiness (not smoky). 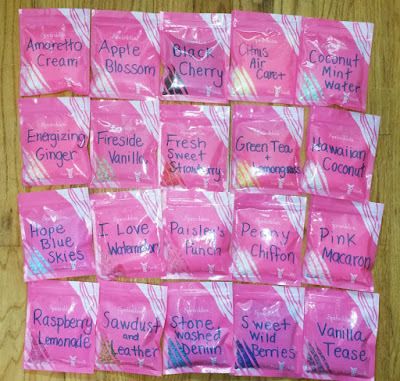 This is a review of Pink Zebra Sprinkles by Krista Schon, an Independent Executive Rank Consultant for Pink Zebra. Krista has been involved in retail sales (stores and direct sales) for over 15 years and has been with Pink Zebra for one year. Outside of Pink Zebra, Krista works full-time as a teacher, so Pink Zebra is her fun fragrance hobby that she runs from home in her spare time. Besides her retail and customer service experience, what sets Krista apart from other consultants is that she specializes in Online Pink Zebra Interactive Facebook Parties and Live Pink Zebra Blend Bashes for busy home fragrance lovers! She is very product knowledgeable and also offers free samples, hostess and party guest gifts to every qualifying party she hosts. If you have any questions about Pink Zebra products, parties, or joining opportunities, she is always available to help! Smok'd Out Candle Company is a new business based in Seaside, Oregon. Emily, the company owner, made her first sale on February 10, 2019. Emily is a full-time college student studying for a degree in business. She has 3 young daughters and a husband at home, and her family has been the driving force behind Smok'd Out Candle Co. Making candles, wax melts and lotions has been a way for Emily to create moments with her daughters and spend more time at home taking care of them. There is a story behind each and every item she makes. Emily is determined not only to create quality products, but to help others do something to better their lives as well. She has an "if I can, then you can too" mentality, and as a person, mother, woman and entrepreneur, she wants to show people that they can achieve their dreams! Currently Smok'd Out Candle products can be purchased from their Facebook page at https://www.facebook.com/SmokdoutCandleCo/, or just call Emily at 360-442-6782. She is working on getting a website up and running. La-Tee-Da! 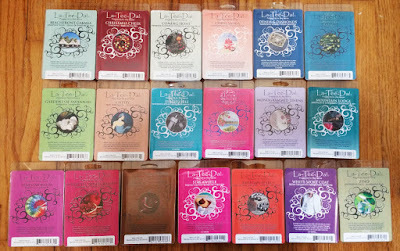 wax melts can be purchased from gift shops across the country, as well as online from sites like Courtney's Candles at https://www.courtneyscandles.com/mmltd.html (where I got mine because she had the best selection, and flat fee shipping was only $5), The Lamp Stand at https://www.thelampstand.com/lateeda-magicmelts.html, and PC Fallon at https://www.pcfallon.com/c-2613-wax-melts.aspx. They sell for $2.95 at Courtney's Candles and PC Fallon, but currently they're on sale at The Lamp Stand for $2.59. There's a store locator on the La-Tee-Da! Fragrance website at https://ltdfragrance.com/where-to-purchase/, and you can download their catalog at https://ltdfragrance.com/catalogs/. All I smell is something bitter and waxy. I don't detect nectarine (peach) or anything tropical (coral). Maybe a floral? Looking at the notes, there's nothing in there that would create such a bitter scent. If anything, based on the notes, it should be a sweet, rich scent. I don't like this one. When melted, I do detect a floral note like rose, but it's still very bitter. It smells a lot like Hanna's Candle Peony & Rose Bouquet (as well as their new Butterfly Wings scent), which I didn't care for due to the bitterness. I expected this to be another eucalyptus spa type scent like ScentSationals Zen, but it's completely different. On cold sniff, it's definitely eucalyptus, with that sinus clearing effect, as well as fresh garden peppermint. There may also be a smidgen of lemon. There's a barely detectable floral way in the background that I think is rose, although this is not a sweet scent at all. Looking at the notes, they're spot on. When melted, however, the rose scent really comes out, and it smells like rose scented soap! But it's still not very sweet because of the eucalyptus, which gives it a slight herbal note when melted. I don't smell the lemon at all, or even the eucalyptus, when melted. I really like this scent, even more after the rose note came out! These new scents are only available in candle form. I haven't found them in wax melts, so I scooped out the soft candle wax and put in the wax warmer instead of burning the candles (which is easy to do, since the wax is very soft, like tub margarine). 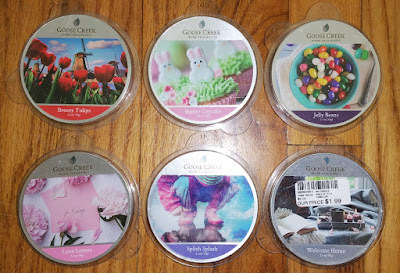 Since Glade candles use a very soft wax and Glade wax melts use a very hard wax, the throw ratings may be different for the melts. If I can find the wax melts, I will update my review. I didn't buy this one because it's a dupe of several older Glade scents I have, including Sunset Walk and Sage & Thyme Market. It's a very strong, pungent, savory, slightly lemony "salad" type scent with no sweetness at all. It's quite nice, although not something I want my house to smell like. A fake, sweet, slightly tart berry scent, like fruit flavored drink mix. When melted, there's an odd "burnt" note way in the background that I don't care for. Smells a like like Glade Volcanic Coconut Cove that came out April 2018, a nice smoky milky coconut. But it's not the same scent. This scent seems to use the Volcanic Coconut Cove scent as a base, but adds a hint of sweetness, a smidgen of cinnamon, a tiny bit of a foodie note like caramel or rum, a little bit of a cologney note, and a tiny bit of wood. Oud is a deep resinous almost tree sappy woodsy scent, and I don't smell that type of wood scent per se. Amber adds a warm note to scents, and I think I do smell that a little bit. Looking at the notes, I don't smell jasmine at all (but maybe that's the slight sweetness). It's not a floral scent at all. It's a great scent, and it smells a bit like ScentSationals Fire Amber and Goose Creek Cozy Home (but not as much as Volcanic Coconut Cove does). This smells like a rich men's cologne note with a sweet tobacco note and possibly a smidgen of patchouli. It almost has a foodie note, like maybe a hint of caramel or rum. I also smell a rich dark wood note. Looking at the scent notes, they're enticing! And there's the rum! I don't really smell leather, but it's probably way in the background. And I don't detect mint at all. I'd say it's a rummy, woodsy, slightly incensey men's cologne scent. And it's fantastic! Although this shares some of the notes with Elegant Amber & Oud, it's a totally different scent. But interestingly, I detect an oud note in this scent even though oud is not in the notes. 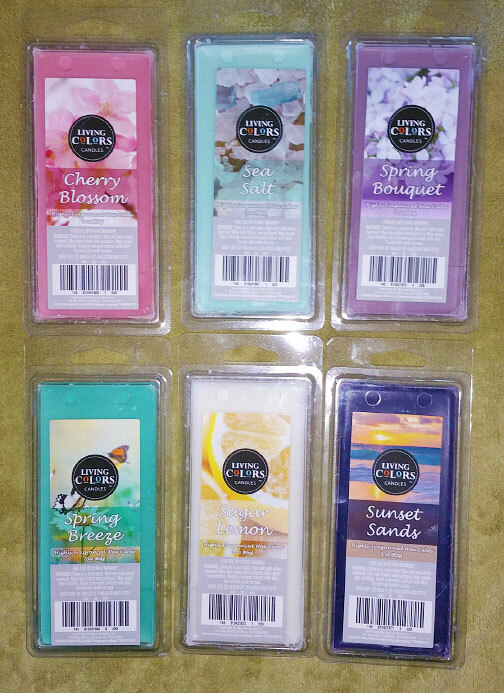 These Living Colors wax melts from Big Lots use the same hard wax as the ones I reviewed in January. The ones I reviewed in February were soft wax, but I suspect they were older scents from the last few months of 2018. Although the new wax is hard, it still has a greasy surface, but it's a much better consistency than the old soft wax. A fantastic sweet lilac scent with a hyacinth note. Although it's a little perfumey, it's more authentic than a lot of lilac scents out there. It's similar to Yankee Candle Sweet Lilac, and Mainstays Blue Hyacinth, but much more similar to the Yankee scent. I don't detect any other floral notes. This is a different lemon scent than their Lemon Bars or Lemonberry Scone scents. This smells like "kitchen lemon", like a fresh sweet lemon scented dish detergent. It's not a bakery or lemonade or spa type lemon scent at all. It's sweet and lemony and clean (but not soapy), and it smells great. After melting for about a half hour, it started taking on a bit of a chemical note that I didn't care for. The scent started dissipating within 2 hours. 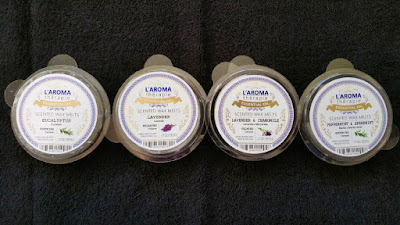 This text review includes 3 additional scents that were not available when I did the video review: Citrus Coast, Mahogany Coconut, and White Lavender. All but 5 of the Kohl's (Sonoma) Spring 2019 wax melts are scents that came out last year (January 2018). A super sweet (almost nauseatingly so) coconut scent with a slightly salty lime note and maybe another fruit. It's much sweeter than other similar scents, but it smells fantastic. Looking at the scent notes, the tanginess is the lemon, although I can't actually pick that note out on its own. 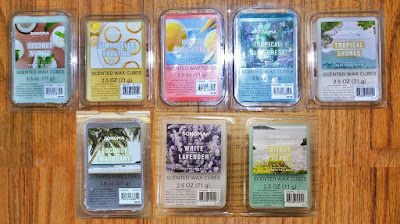 I don't know if this is the same Coconut Mojito scent that came out last year (https://www.scentedwaxmeltreviews.com/2018/01/kohls-sonoma-scented-wax-melts-reviews-spring-2018.html). The notes for that scent were coconut, strawberries and mint, but I described the scent the same way, although I recall that I didn't care for the scent. This scent returned from last year (https://www.scentedwaxmeltreviews.com/2018/01/kohls-sonoma-scented-wax-melts-reviews-spring-2018.html), although I think it was also available a year or two before that. I smell mostly grapefruit, with an orange note and possibly a hint of zesty lemon. It's a nice fresh thirst-quenching summer scent. 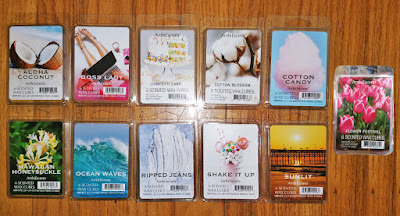 This scent returned from last year (https://www.scentedwaxmeltreviews.com/2018/01/kohls-sonoma-scented-wax-melts-reviews-spring-2018.html). It's a very nice fresh, watery men's cologne scent with maybe a hint of wood and a smidgen of coconut. Looking at the notes, I don't smell citrus at all. 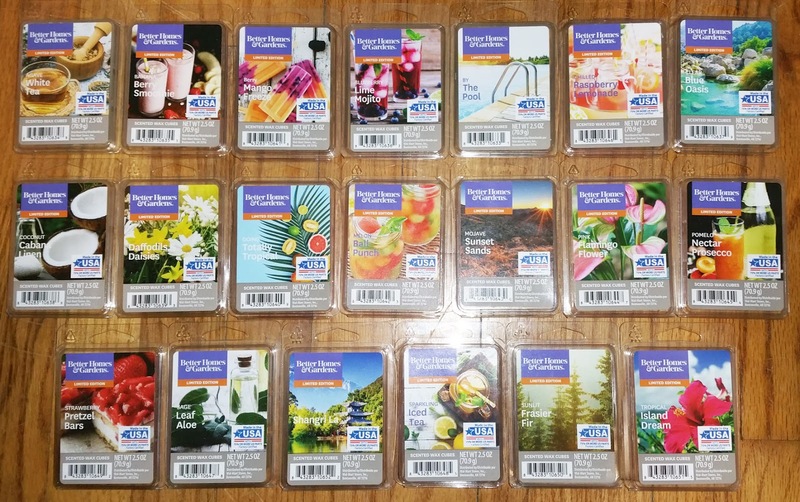 Also returning from last year (January 2018 - https://www.scentedwaxmeltreviews.com/2018/01/kohls-sonoma-scented-wax-melts-reviews-spring-2018.html) are Watermelon Sangria, Tahitian Pineapple, and Blue Hawaiian. And maybe a couple of others. I didn't buy them again this year because I didn't care for them. Disappointly, all of these except 2 are dupes of ScentSationals or Better Homes and Gardens scents (AmbiEscents melts are made by ScentSationals). 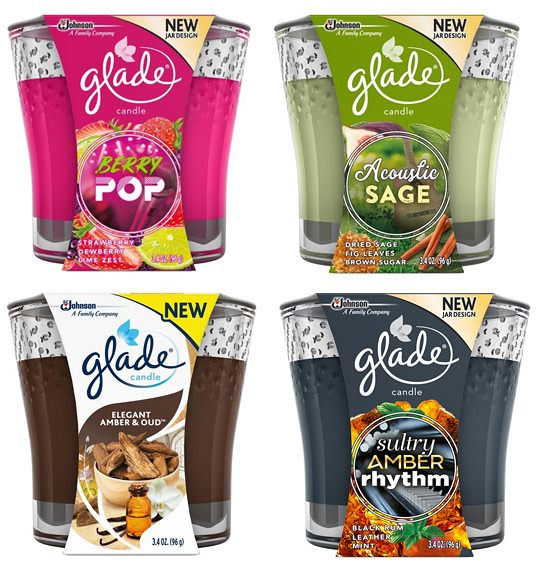 At $2.99 each, it doesn't make sense to buy them unless you can't find the original scent at your local Walmart (where they cost $2.00). This is the same scent as ScentSationals Coconut Vacay (which is similar to Better Homes & Gardens Island Coconut Lime, but with mostly lime and just a hint of coconut, and without the slightly soapy note that Island Coconut Lime has). The scent notes are totally wrong, as this is a coconut scent with a strong lime note, and no vanilla, cake, or buttercream notes. Actually, sniffing them side by side, they "might" be very slightly different. Aloha Coconut seems to be MORE limey than Coconut Vacay (although not as limey and sweet as Mainstays Coconut Lime). This is the same as AmbiEscents Sugar Cookies, basically just a nice sweet vanilla scent with a buttercream note (a slightly different scent from ScentSationals Vanilla Bean). In fact, my store receipt says "Sugar Cookie"! This is a laundry scent, but it's different from Cotton Blossom, which is kind of cross between laundry detergent and fabric softener. This scent smells more like musk, gardenia, and a smidgen of rose, with a little bit of a fresh laundry/fabric softener note. Despite the Egyptian cotton note in this scent, it's a different scent from ScentSationals Egyptian Cotton. And despite the florals and musk, it's not a super sweet perfumey scent, because of the laundry note. I haven't smelled this one before, so I don't know if it's a dupe of another scent. Okay, the notes are exactly the same as ScentSationals Laundry Basket, which I no longer have. But I do have AmbiEscents Laundry Basket and I sniffed them side by side and they're totally different scents. But AmbiEscents Laundry Basket and ScentSationals Laundry Basket may be different scents. This is a review of Better Home and Gardens Spring 2019 wax melts. 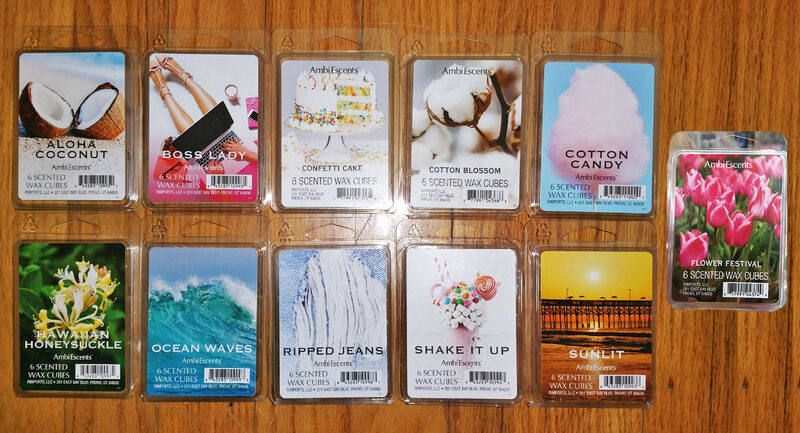 I've included links where each scent can be found on the Walmart website, as well as the UPC codes in case you want to do your own search on Brickseek. This is a very pleasant and delicate scent that smells like a luxurious milky white tea body cream. I can smell a little bit of the tea, but it's very subtle, and it's not a foodie scent at all. It also has a bit of a floral note, as well as a smidgen of an herbal note. And although it's sweet, it's not overly sweet and definitely not perfumey. I really like this one. It's perfect for a bedroom or baby's room. I adore this scent, and if it were stronger I'd buy a bunch! It should work fine in a small room though. Most people love this scent. This smells like the name, a sweet combination of banana and berries. I smell strawberry with a slight banana note. It's not an authentic scent, nor is it meant to be. It's a fake banana and berry candy type scent that reminds me of the old BB Bats banana flavored taffy candy. I really like it! Someone said it's "dominated by the berry. That aspect makes up about 60-70% of the blend and the creamy banana is about 30-40%! Definitely a yummy one!" I smell pineapple... and apple! It's very nice. Someone else described it as, "Almost a dead on dupe for Bath & Body Works Aloha Kiwi Passionfruit. It’s a really nice, watery fruit scent that isn’t too sweet! There’s almost a perfumey aspect in the background as well." This is very similar to the old ScentSationals Blackberry Lemonade scent, but that scent was more lemony and not as sweet, and didn't have as much of a berry note. But it was one of my favorites. This is a fruity scent (I'm not sure if it's blueberry per se) with a lime note and a smidgen of soapy lemongrass. It's very nice. Looking at the notes, this is not an "effervescent" or fizzy scent. And verbena might be the hint of lemongrass. I don't detect mint at all. Someone said, "I smell blueberry and lime, no mint. Not the same blueberry as Better Homes & Gardens Blueberry Bundt Cake, thank goodness." Someone else said, "Mainly a berry based carbonated scent to my nose, the lime also comes in and adds a fresh zing to the blend! There’s the same fizzy drink note in this one as Better Homes & Gardens Ginger Berry Margarita from last year! Really makes the scent realistic!" I like this one! It's coconut with a hint of fruit that I couldn't put my finger on, until I realized it's melon, either honeydew or cantaloupe but I think it's more cantaloupe although it's very sweet, like cantaloupe candy. It's not the same scent as the old ScentSationals Calypso Sands though, as that was honeydew with a sweet floral and maybe a smidgen of coconut. I think there's also a tiny bit of a cologney note, a smidgen of light beach wood to temper the sweetness a little, and possibly a barely detectable hint of chlorine (unless I "think" it should be there because of the scent name). This is similar to Better Homes & Gardens Maui Beach Waves but much sweeter, and with the fruity candy note. It's sweeter when melted than it is on cold sniff. I believe this is the "Splash" side of the old Better Homes & Gardens By The Pool duo from 2016. The scent lasted all day, at least 8 hours. Someone said it's a "really soft scent, almost like a very light cologne citrus watery blend mixed with a beachy coconut! Fantastic scent that smells like lemonade, with a faint raspberry note. I thought it would be the same as Better Homes & Gardens Chilled Cherry Limeade from 2017, but it's a different scent. A nice fresh men's body wash scent with a strong salty lemon note (which might be the palm). It's sweet but not overly sweet. I have a lot of men's cologne/body wash scents and they usually all smell pretty much the same, but this one is different and I love it. Someone in our group said, "It’s a really fresh/aquatic fragrance with pops of a leafy greenery essence. There is a smidgen of a cologney undertone to it, but it’s not overkill run you out the house defcon 5 I need oxygen cologney. It’s really good!!" This smells almost exactly like the new ScentSationals Sun Drenched Linen scent, but ScentSationals doesn't put out the same scents at Walmart in the same season. I think Sun Drenched Linen has a smidgen of a cologney note (barely noticeable) and Coconut Cabana Linen has a smidgen of a coconut note. But I think they start with the same base scent, which is a slightly bitter laundry type scent that has a little bit of a chemical note when melted. I don't care for this scent, but I like it more than the Sun Drenched Linen scent. It looks like I'm the only one who thinks they smell the same. Someone said, "Sun-Drenched Linen smells like a fresh men’s cologne and Coconut Cabana Linen is brighter with a tropical note." Someone else said, "I don't think they smell anything alike. Coconut Cabana Linen has a strong coconut to it." Someone said with this scent, "The linen is stronger and the coconut is not sweet. It’s an elegant scent." Someone else said, "I love Coconut Cabana Linen but there are sometimes where I feel like it smells like a public bathroom cleaner." Someone else said, "It’s a nice laundry just a very subtle hint of coconut". I adore this scent! I smell orange blossom/neroli and a sweet, rich floral that I can't place, like honeysuckle or magnolia. There's something else in there that gives it a warm sweetness, like a honey note. Looking at the notes, it's probably the musk, and this scent is a little perfumey but it's really more of an authentic floral. It's different from other floral scents I've smelled. It doesn't smell like daffodils or daisies though, since neither of those flowers actually have a floral scent! Someone said, "Can’t place the flowers but very authentic. Does not smell like honeysuckle like Better Homes and Gardens Bluebells and Buttercups does." A nice sweet tropical fruit scent. I think I smell guava and a hint of pineapple. It has a candy like note. I can usually take or leave tropical scents, but I love this one! Looking at the notes, yes, I do detect a very slight perfumey note. Notes: Watermelon, honeydew, and cantaloupe mixed with sugar water, vanilla, and peach, with citrus accords of mandarin, orange, and lemon to add sparkle. This just smells like cantaloupe, with maybe a hint of cucumber. It's only slightly sweet, and a little bland. I'm not a fan of cantaloupe scents. I think this would smell better if it were sweeter. Someone said this smells very authentic, like melon on a plate. This smells like men's cologne with another note I can't figure out, like a tropical wood (but not palm, as that has a nutty coconut note that this scent does not have). I do smell a hint of wood and possibly a barely detectable smidgen of pineapple. That other note is a little sour, but not in a bad way. Maybe that note is lemon? It's a dupe of a scent I smelled a few years ago, but I don't remember which one. This is just an okay scent for me. Looking at the notes, the fruits are mango, nectarine, and peach! Someone said, "I think there’s a little fruit in there, but it’s a clean sunshiney scent, very gender neutral." Someone else said, "This one is super sweet & perfumey! Also borderline floral.. it really doesn’t smell like what you’d expect after reading the name! But there’s also a strong lemon in the blend too, and I also want to say I’m picking up on coconut? This one is a really complex blend!" Someone else said, "It's kind of musky like cedar but in a summery way." Notes: Fruity and floral fragrance blending pink lemon, waterlily, and mandarin with peony, freesia, and jasmine. A base of musk, white woods, and vanilla evokes feelings of calm and relaxation. A nice pleasant slightly sweet candy like floral with a slightly salty note (I'm finding that note in a lot of the new scents) that gives it a richness, a smidgen of lemon, and another fruity note like strawberry or guava, but the fruity note is like a fruity candy note. And there's a tiny bit of warmth. Melted, I also detect a hint of an oriental spice note that gives this scent a very slight perfumey note. Pomelo is a grapefruit type scent, and prosecco is a sparkling white wine. Thankfully this scent doesn't smell like wine, because scents that try to smell like alcoholic beverages (unless they're the creamy tropical type) often end up with a sour fermentation note. This scent might have that way in the background, but if so, it's barely detectable. And there are no "sparkling" or fizzy notes. I don't smell grapefruit either. It's a super sweet candy like scent that smells more like rich apricot nectar, although it's not a peachy scent at all. Some of that sweetness may be a floral, like gardenia or sweet pea. I didn't think I would like this one based on the name, but I love it! Melted, it's extremely sweet, with slightly more of a floral note and less of the fruity note, almost like straight syrupy sugar mixed with a floral and a hint of apricot nectar. Although it's extremely sweet, it doesn't have that rich, buttery, slightly nauseating sweetness like ScentSationals Sugar High (it's not even really a foodie scent). It's also one of those scents that's not overly strong, but the scent takes over the entire house. Someone described it as "zingy and crisp". An interesting super salty savory scent with a lemon note and a hint of an herbal note. It might also have a smidgen of bergamot that gives it a barely noticeable fresh cologne note way in the background. It's just barely sweet. I like it. It's very similar to the new ScentSationals Cactus Garden. They're both extremely salty, and savory with a slight lemony note. I think Cactus Garden is slightly more lemony, while Sage Leaf Aloe has a tinge more of an herbal note. I like them both, but I like Cactus Garden a little more. A couple of people said this smells like Yankee Pink Sands, which is a sweet almost perfumey scent. Pink Sands also has a coconut note, and come to think of it, I think this scent also has a smidgen of coconut way in the background. I adore this scent! It's a soapy floral with a hint of saltiness (I'm noticing that salty note in a lot of the new scents, and I like it; it adds body and richness to the scent), although that saltiness might actually be bergamot (which gives scents a cologne note, but I don't smell cologne notes in this scent). The floral is not really authentic, but it's also not perfumey and it's not an overly sweet scent. It smells like a pleasant floral soap. The floral note might be rose or jasmine. Looking at the notes, there's the rose, jasmine and bergamot. I don't smell ginger or mandarin (orange) at all. Someone said it smells a lot like Dove soap. This smells very similar to the old ScentSationals Blackberry Lemonade, but I don't think it's exactly the same. It has that same main note of slightly salty, slightly soapy lemon. But I think I do detect a very subtle tea note in this scent. Someone said it's the "exact scent of powdered lemon flavored iced tea mix". Someone else said, "Super distinct herbal tea notes mixed with lemon!" It's a super rich, sweet creamy strawberry scent with a little bit of saltiness. I don't smell pretzels per se, like no bready note, but the saltiness gives it an extra richness that makes this scent so fantastic. A couple of people said this smells a lot like Better Homes & Gardens Wild Berry Cheesecake. Someone said it smells like a "syrupy dessert topping strawberry, not a fake scent, very yummy!" Someone else said, "You get the juicy base strawberry note but a hint of salty pretzel also comes in. Love the sweet & savory combo!" It's a pine scent. It's got a little bit of a "harsh" pine note (rather than a smoky woodsy spruce type scent), and I don't detect any other notes or sweetness. It's a nice pine scent though, and perfect for mixing with other scents like orange, lemon, fruit, vanilla, lavender, cologne, etc. Someone said it smells like "every other Christmas tree scent. Really crisp & woodsy, no sweetness." Notes: Citrus lemon and grapefruit shimmering with red currant and touches of peach wrapped in warm jasmine and fresh peony over breezy musk and amber. A very sour scent with a lemon note that has a little bit of a gasoline vibe. But it actually isn't quite that awful. It's not the same kind of sour as the new ScentSationals Flamingo scent, which is more of a pungent, slightly "warm" fruity scent and smells fantastic. This scent is harsher and not fruity. It might be a dupe of ScentSationals Isla Bonita from 2016, but I don't have that scent anymore to compare.